Next month, Smart USA will launch the first US market electric vehicle with a separate rental program for the battery pack. Those buying or leasing the Smart Fortwo Electric Drive will have the option of renting the lithium ion battery for a monthly fee. The US base price for the Smart Fortwo ED is $25,750, including shipping. The battery is covered under Smart’s four-year/50,000 mile warranty, but once the warranty expires, owners and lessees must pay for battery maintenance and/or replacement. The rental price continues to cover the battery even after the warranty expires. When under warranty, if the battery drops below 80 percent efficiency, Smart will replace it. In Europe, the purchase price starts at the equivalent of $30,398 with battery included, and around $23,680 when the battery is rented. Since its debut in Europe last fall, about 97 percent of buyers and lessees have opted to rent the battery, said Tracey Matura, head of Smart USA. Matura is hopeful the battery rental could “minimize the anxiety” that the battery would die out before the car. It went over so well in Europe that, “We thought, why not offer the same in the US?” she said. In Europe, the monthly battery rental is 65 euros, or about $83, for as long as 10 years. Smart USA has not yet set a monthly US battery rental price. 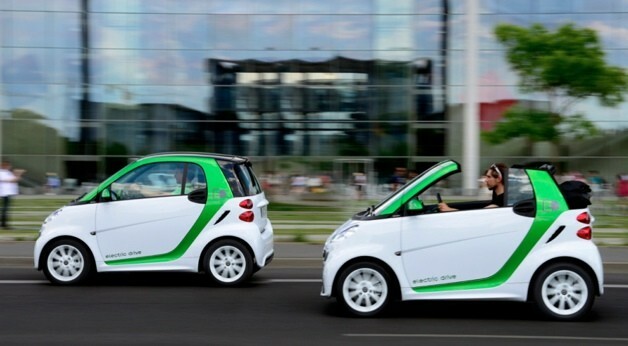 In January, Matura told AutoblogGreen about the introduction of the Smart ForTwo ED in the US market. There is a Tailor Made by Brabus version coming out, and Smart USA will be able to wrap the new ForTwo ED for more personalization. Maura said there up to 6,200 combinations in the “standard” lineup. While the Smart ED is an impressive two-seater, there’s no word yet on when the four-seater Smart Forfour might make it to America. An all-new Fortwo is coming in 2015. After starting production in June 2012, Smart built more than 1,000 Fortwo EDs last year. Smart USA expects to sell or lease about 2,000 of them this year. Supplies will be tight due to high demand in Europe, the company said. Smart expects to make 6,000 Fortwo EDs in 2013, and predicts global production number will rise to a five-digit figure by 2014. Smart Fortwo ED will have battery rental option in US, price not yet disclosed originally appeared on Autoblog Green on Fri, 12 Apr 2013 18:15:00 EST. Please see our terms for use of feeds.